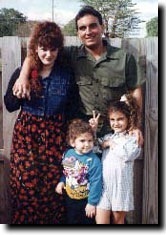 This is a prison visitation photo of me and my family from the federal prison camp in Miami. Currently I am being held 750 miles from my home at FPC Talladega. My house was raided in October of 1994 based on a tip to the police. I was convicted for growing 110 cannabis plants and sentenced to a five year minimum mandatory sentence. Although the U.S. Sentencing Commission changed the plant/weight ratio so that 110 plants is no longer equated to 110 kilos of marijuana (It is now only 11 kilos) this amendment did not affect the Statutory law and I was given 60 months instead of a 21-27 month guideline sentence. In prison I work in the Law library and have become even more of an active activist then I was on the street. I send stamps when I can and encourage others to write and have their families write our government servants. Remember "When we the people lead, eventually the government servants will follow. To the Hempest future..."
My wife divorced me after doing one year's time. I am due to be released to a halfway house in July of 1999.